Alone and in the wild, Lara must scrounge, scavenge, craft and survive the harsh elements by day, as well as lethal threats from enemies, both man and beast, by night. This is her ultimate woman-versus-wild test to push the limits of how long she can survive on her own in sprawling, unforgiving landscapes. Fire takes fuel, cold kills the unprepared, food restores health, but everything must be caught, collected, or crafted. You start with nothing and must find everything. Challenge friends to your longest survival run and battle to the top of the leaderboards for the title of Ultimate Survivor. 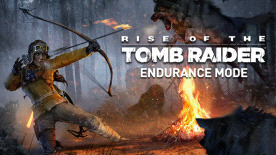 Requires [Rise Of The Tomb Raider](http://www.greenmangaming.com/s/gb/en/pc/games/action/rise-tomb-raider/) (base game) to use this DLC.